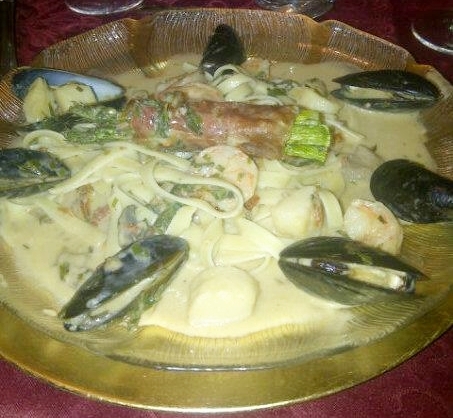 Pasta and Seafood…….. What’s not to love? Both are tasty, good for you and very easy to prepare and when you combine the two you can’t help but arrive at a very memorable meal. Oh and adding some proscuitto wrapped asparagus takes this already very tasty dish to a whole new level. Before we go any further I do have to mention that my ever lovely and talented daughter Alison was a tremendous help in putting this whole dish together and I could not have pulled this one off without her…….. Kudos kiddo. Thanks for the help. Sprinkle with a little chopped parsley if desired and enjoy. Well my goodness, aren’t you getting adventurous off the grill? This sounds delicious! I love this recipe and will do it again when the price of seafood drops a bit.